The Fujifilm X-Pro2 is a compact system camera featuring a brand new 24 megapixel X-Trans III sensor, high-performance X Processor Pro image processing engine, an Advanced Hybrid Multi Viewfinder which cleverly combines an optical viewfinder and an electronic viewfinder together, a robust weather-resistant body, a new focal plane shutter with a top speed of 1/8000 sec. and flash sync up to 1/250 sec, 77 phase-detection points and 273 contrast-detection points, and support for dual SD memory cards. The Fujifilm X-Pro2 body-only costs £1349 in the UK and $1699 in the US. Three years in the making, at first glance the new Fujifilm X-Pro2 looks very similar to its venerable predecessor, the X-Pro1, which was released way back in 2012. A closer look, though, reveals a number of subtle design tweaks, and it's all change "under-the-hood", with a new 24 megapixel sensor, faster X Processor Pro image processing engine, improved Auto-focus system and an enhanced Hybrid Multi Viewfinder all promising to make this the best X-series camera to date. 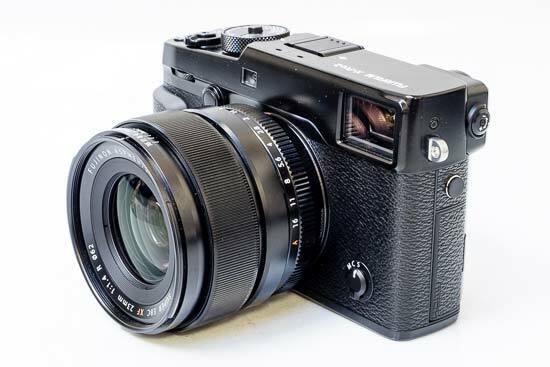 The all-black Fujifilm X-Pro2 remains a classically styled interchangeable lens camera that recalls film rangefinders from the past, with a stunning retro design that still draws admiring glances from everyone that sees and holds it. Fujifilm have been extremely busy in the 4 years since the release of the X-Pro1, now offering 21 different X-series lenses (there were just 3 available at the launch of the X-Pro1). With the concurrent announcement of the XF 100-400mm optic, Fujifilm offer lenses that cover a focal range from 10-400mm, equivalent to 15-600mm in 35mm full-frame terms, and the general consensus amongst reviewers and end users is that those 21 lenses are invariably of high-quality. The Fujifilm X-Pro2 is an impeccably built camera, with absolutely no flex or movement in its chassis thanks to the die-cast magnesium alloy top and base plates and machined control dials. At the same time, it's actually much lighter than a first glance might suggest, weighing in at 495g body only with the battery and memory card fitted, which is 45g heavier than the X-Pro1. Measuring 140.5mm (W) x 82.8mm (H) x 45.9mm (D), it's taller, wider and deeper than all other current compact system cameras, and again slightly bigger than the X-Pro1. There are still a few plastic buttons and controls on the X-Pro2, most notably the memory card / battery compartment door and the flap for the HDMI port, both of which wouldn't look or feel out of place on a cheap compact, but other than that the X-Pro2 offers excellent build quality. The X-Pro2 is the second weather-proof X-series camera, with 61 points of weather sealing offering dust-resistance, water-resistance and freeze-resistance down to -10°C, and it offers an impressive shutter durability of 150,000 shots. In comparison to its predecessor, the X-Pro2 has a more pronounced hand-grip at the front and a larger space at the rear for your thumb, with your grip helped in no small part by the textured faux-leather surface that runs around the full width of the camera. Two small metal eyelets on either side of the body are used for connecting the supplied shoulder strap, which isn't quite as luxurious as the rest of the package. A metal tripod mount is positioned in-line with the centre of the lens and next to the memory card / battery compartment, so you can now change the card/battery without having to remove the camera from a tripod. Two memory card slots, a first for mirrorless cameras, are located on the right-hand flank of the camera when viewed from the rear. The X-Pro offers compatibility with Ultra High Speed UHS-II SDXC memory cards via Slot 1, which has the main benefit of increasing the data writing speed in continuous mode to about twice that of a conventional UHS-1 card. At the heart of the X-Pro2 is the brand new 24.3 megapixel APS-C sized “X-Trans III” CMOS sensor, with APS-C being a size that's more commonly used by the majority of DSLR cameras than by compact system cameras. 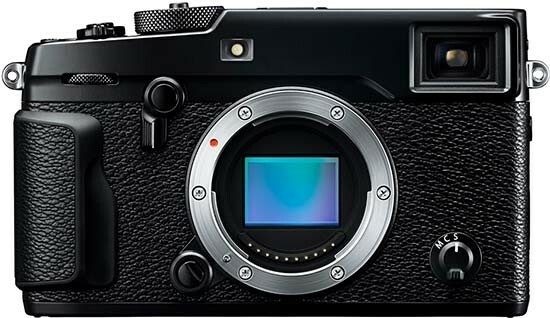 Fujifilm actually claim that the X-Pro2's sensor will deliver image quality that surpasses most APS-C DSLRs and even some full-frame ones, thanks to the unique sensor which has a type of colour filter array that mimics film grain and no optical low-pass filter for higher resolution images, and as our test photos and sample images on the next two pages show, the X-Pro2 actually does live up to those claims. We won't say any more at this point other than to recommend that you take a look at our Sample Images for yourself. If you use lenses with fast maximum apertures of f/1.4-2.8, in conjunction with the large APS-C sensor it makes it easy to throw the background out of focus and achieve some really nice bokeh effects. The combination of the fast apertures and the extended ISO range of 100-51200 makes the X-Pro2 very well suited to low-light shooting, allowing you to hand-hold the camera in places where you'd usually be reaching for a tripod (if allowed) or other support. The clever ISO Auto Control setting allows you to set a default sensitivity, a maximum sensitivity (up to 12800) and a minimum shutter speed (1/60th is a good starting point), with the camera over-riding your ISO choice if it thinks you're being too ambitious whilst maintaining a shutter speed that won't introduce camera shake. With its new focal-plane shutter, the X-Pro2 has a more adaptable top shutter-speed limit of 1/8000th second in all shooting modes than the X-Pro1's 1/4000th speed. This allows you to select a faster aperture even in bright conditions or when shooting with flash during the day, although as there's no built-in ND filter as on the X100-series cameras, if you want to use, say, the 35mm lens at F/1.4 in very bright sunlight then it's still a good idea to buy an actual glass ND filter. The X-Pro2 utilises a focal-plane shutter rather than the leaf shutter that the X100-series have, much like a regular DSLR camera. This results in slightly noisier operation and a much slower flash-sync speed of 1/250th second (versus the X100's 1/4000th second). The X-Pro2 also has an electronic shutter in addition to the mechanical one, which provides a much faster top shutter speed of 1/32,000th second. This allows you to continue shooting wide-open with fast aperture lenses in the brightest of conditions without having to resort to fitting a glass ND filter or using external flash and lights. There are some important caveats with the electronic shutter - the ISO range is restricted to 200-12800, you can't use the flash at all, and the slowest shutter speed is only 1 second, but overall it's a great addition that makes the X-Pro2 more versatile. It's also possible to set the electronic shutter in 1/3 steps from a range of 1sec to 1/32000sec. The X-Pro1 was renowned for its auto-focusing system, but unfortunately in a negative sense - it wasn't exactly the quickest in the world, either compared to other X-series cameras or if you were used to shooting with a DSLR. 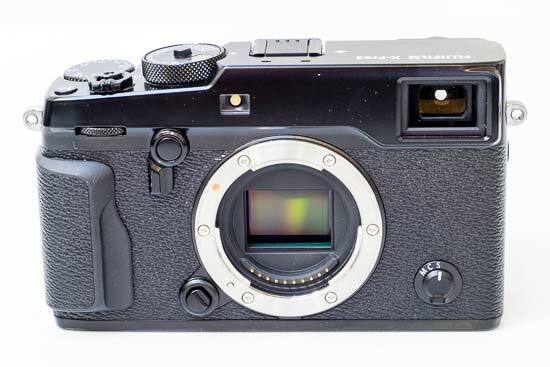 Fujifilm have certainly addressed this shortcoming in the X-Pro2, which can auto-focus in as little as 0.06 seconds and offers an increased number of AF points - 77 phase-detection points versus the X-Pro1's 49 contrast-detection points - again laid out in a 7 x7 grid, with 40% of the imaging area covered by the fast and precise phase detection AF pixels. If you want even more control, you can select the 273 points option which splits the same area of the frame into a 13x21 grid of smaller contrast-based AF points, of which 77 are the phase-detection points. The X-Pro2 is the latest X-series camera to offer Zone and Wide/Tracking modes which utilise the larger 273-point area to capture moving subjects. In Zone mode, you can select a 3x3, 5x3 or 5x5 zone out of the 273-point AF area. During AF-C focus, the X-Pro2 continually tracks the subject, positioning it at the centre of the zone. The centrally positioned 3x3 and 5x3 zones in particular deliver fast focusing thanks to the on-sensor phase detection AF. The Wide/Tracking mode combines the Wide mode (during AF-S), in which the X-Pro2 automatically identifies and tracks the area in focus across the 273point AF area, and the predictive Tracking mode (during AF-C), which uses the entire 273-point area to continue tracking the subject. This feature enables continuous focusing on a subject that is moving up and down, left and right or towards and away from the camera. The X-Pro2 also offers Eye Detection AF, which as the name suggests automatically detects and focuses on human eyes. Manual focusing is activated by setting the focusing switch on the front of the camera to Manual and using the ring that encircles the lens to focus. In terms of focusing aids, the Standard option offers a distance scale along the bottom of the viewfinder (both the OVF and EVF) and on the LCD screen if you're using that for composition, with a white bar indicating the the focusing distance and a blue bar showing the depth of field, which actually changes in line with the current aperture - very handy. 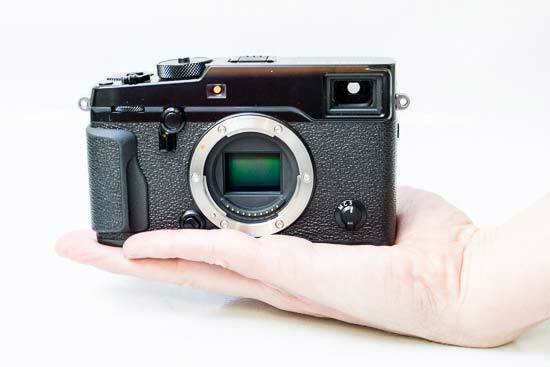 The X-Pro2 has another trick up its manual focusing sleeve in the shape of the rear command control (the dial which sits under your right thumb). You can press this in to magnify the view in the electronic viewfinder or LCD screen. Furthermore, if you hold down the rear command control dial, the manual focusing aid then switches to Digital Split Image, and then to Focus Peaking - a very neat way to quickly change between the three modes. The second manual focusing method is the Digital Split Image feature. Harking back to film cameras of the past, this displays dual images on the left and right which then need to be lined up together for accurate manual focusing, enabling accurate focusing especially when shooting wide-open or for macro shooting. It's much easier to understand in practice than written down. The third and final method is the Focus Peak Highlight function, which displays a white line (the colour and strength are customisable) around the subject when it's in focus. The Fujifilm X-Pro2 offers three ways of composing your images. In addition to the improved 3 inch LCD monitor on the back, which now has 1.62million dots and offers 100% scene coverage, the X-Pro2 also features the much-talked-about hybrid optical viewfinder / electronic viewfinder system. Optical viewfinders are something of a dying breed amongst modern cameras, so it's very refreshing to see the reverse Galilean model on the X-Pro2, with a 0.36x / 0.6x magnification and low chromatic aberration and distortion. A parallax corrected framing rectangle shows roughly what the picture will include (about 92%), with the framing lines and focus point moving when the shutter button is half-pressed to show the correct framing for the current focusing distance. It also now incorporates a diopter correction mechanism and has a longer eye point of 16mm making it easier to see through, although you'll probably want to use gaffer-tape to lock it into place, as its location makes it prone to being inadvertently changed when stored in a bag. The new Bright Frame Simulation function allows you to simulate the angle of view of each focal length without having to replace the lens, so you can change lenses more accurately. So far, so good - but this is no ordinary optical viewfinder. Fujifilm have implemented an integrated prism for the electronic viewfinder onto the optical viewfinder, with the latter able to show the shooting frame and a variety of shooting data. So you get a large, bright optical viewfinder which shows a bigger area than what the camera actually captures when you take a photo, useful for seeing when moving subjects are about to enter the frame, overlaid with useful information including exposure compensation, shutter speed, aperture, focusing distance scale, an electronic level and histogram (there are 14 options in total) - even the focusing point is highlighted! Additionally, it also now features the same Electronic Rangefinder (ERF) mode from the X100 series, where a small electronic viewfinder is overlaid on top of the optical viewfinder, which can be used to check focus, the angle-of-view, exposure and white balance in real-time. And at the flick of the Viewfinder switch on the front of the camera, you can easily switch from the OVF to the EVF, which now has 2.36 millions dots, a faster display speed of 85fps for smoother tracking of a moving subject, a shorter blackout time of 150ms, and provides the same exact 100% coverage as the rear LCD screen, plus a parallax corrected view, accurate preview of exposure and depth of field, and the ability to see all of the information that you can view on the rear LCD. It also shares a similar Graphic User Interface to the X-T1, which no optical viewfinder could ever hope to emulate. The default Full mode does what its name suggests and displays an uninterrupted view of the scene with all the settings information displayed outside the frame so that you can really concentrate on your subject. Normal provides an optimum view, including the shooting settings. Finally, the displayed settings in the Full and Normal modes automatically rotate when the camera is held in a portrait orientation. Note that the EVF on the X-Pro2 is significantly smaller than the one on the X-T1 - 0.59x versus 0.77x. As the X-Pro2 is an interchangeable lens camera, when an XF series lens is mounted the specific lens data is communicated to the X-Pro2 and the viewfinder magnification and frame size are automatically set. Using the optical viewfinder with longer lenses does result in a rather small viewing area, so much so that I still preferred to switch to the electronic viewfinder when using something like the XF 50-140mm, despite the bright frame being enlarged to cover a focal length of 60mm to 140mm. Written down, the hybrid optical viewfinder / electronic viewfinder sounds pretty complicated, but in practice it's actually very intuitive to use. The X-Pro2 has a built-in eye sensor so that you only have to hold the camera up to eye-level to switch between the rear LCD and the hybrid optical viewfinder / electronic viewfinder (or you can press the View Mode button). Then it's simply a case of using either the bright OVF or the slightly darker EVF, with the camera automatically switching to the EVF to instantly playback the image. Just make sure that you turn the electronic level on when using the OVF to help combat parallax error and keep your horizontals and verticals straight. In terms of operational speed, the Fujifilm X-Pro2 is a much stronger performer than its predecessor. We've already discussed the now very fast auto-focusing, and shutter lag is also virtually non-existent on this camera, so once you have set the focus, you'll never miss the moment because the camera can't fire the shutter quickly enough. Continuous shooting speeds are also improved, with a top rate of 8fps (JPEG: 83 frames, Lossless compression RAW: 33 frames, and Uncompressed RAW: 27 frames), depending on the speed of your memory card, with a slower 3fps speed also available. Note that both the focus and the exposure are set according to the first frame in each series, so it's not a particularly good system for tracking fast-moving subjects in varied lighting conditions. The write speeds from pressing the shutter button to recording to the SD / SDHC / SDXC memory card are much faster, too. Shooting a single RAW + Fine JPEG takes about 2 seconds to record to a card with a write speed of 60MB/s, and you can take another shot almost straight away. Thankfully the camera doesn't lock up completely for a long time if you shoot the maximum number of images in a burst, allowing you to continue shooting after just a few seconds. The X-Pro2 also offers interval timer shooting for time lapses, with intervals of 1 second to 24 hours and up to 999 frames. The X-Pro2 features enhanced built-in wi-fi connectivity, although there's no dedicated button to access it (you have to configure one of the Fn buttons or access it via the menu system). Install the Fujifilm Camera Remote App and you can transfer your pictures immediately to a smartphone or tablet PC and then edit and share them as you wish, transfer stills and video onto the camera, and embed GPS information in your shots from your smartphone. You can also control the camera remotely, with the list of available functions including Touch AF, shutter release for stills and movies, shutter speed, aperture, exposure compensation, ISO sensitivity, Film Simulation modes, White Balance, macro, timer and flash. The built-in wi-fi also provides a simple means to backup your photos to your home PC. 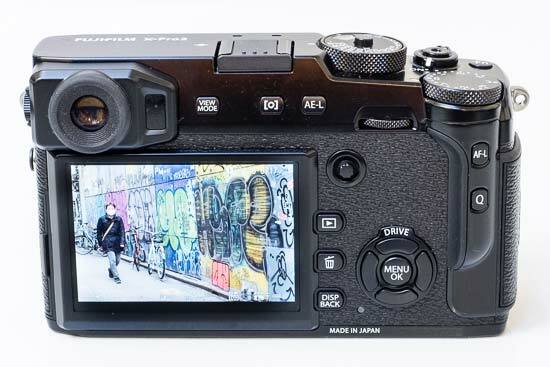 The Fujifilm X-Pro2 can record Full HD 1080p movies at 60p / 50p / 30p / 25p / 24p for up to 14 minutes with stereo sound, with the option for turning this mode on assigned to the Fn button on top of the camera. It's fair to say that the X-Pro2's movie mode still isn't overly advanced. You can set the aperture and shutter speed before recording begins, but not during, and you can also set the Film Simulation mode, so black and white footage is possible. Continuous auto-focusing is possible, although it tends to hunt around a lot before locking onto the subject, and manual focusing is also available. There is a HDMI port for connecting the X-Pro2 to a high-definition TV, although as usual there's no cable supplied in the box, and you can adjust the level of the internal microphone and attach an external mic for better sound quality via the new combined Mic/Remote port. One area in which the Fujifilm X-Pro2 again excels is its handling, thanks in no small part to the numerous external controls that make changing the key settings a breeze, especially when holding the camera at eye-level. Most of the XF lenses have a circular aperture ring, with 7 or 8 markings from the maximum to minimum aperture and an Auto setting in case you want the camera to take control. This dial also allows you to choose third-stop apertures. The X-Pro2 also now has front and rear command dials (just like the X-T1), so if you don't want to use the aperture ring on the lens, simply set it to A and use the front command dial instead to change the aperture. On top of the X-Pro2 is a large, tactile and lockable control dial for setting the shutter speed, with settings ranging from 1 second to 1/8000th second, an Auto option, a T setting for longer exposures (2 to 30 seconds, set via the circular command wheel) and a Bulb mode for exposures up to a whopping 60 minutes in length. Fujifilm have cleverly set the ISO control dial into the shutter speed dial, with the former accessed by lifting the shutter speed ring up and then turning it to change the ISO. The only drawback is that this is the only way to set the ISO speed - you can't do it via the Quick menu or Main menu, which may irk some users - and also the ISO dial isn't illuminated and therefore difficult to use in the dark (exacerbated by the lack of menu access). Alongside the shutter speed dial is another tactile dial for changing the exposure compensation (now running to +-3EV with a new Custom mode which switches the exposure compensation operation to the front command dial and expands the range to ±5EV). Together these three controls make it extremely easy to set the exposure., although it's too easy for the exposure compensation dial to be changed whilst storing the camera in a bag or hanging off a strap, so much so that we quickly learned to always check this dial before beginning shooting. Three other controls complete the X-Pro2's top-plate. The small but responsive shutter release button is encircled by the On/Off switch, which in turn has a thread for a very traditional mechanical cable release - there's no need to buy an expensive dedicated accessory for this camera. Alongside is the Fn button, which by default provides quick access to the Movie Recording, but can be customised to suit your own needs from 25 different settings. Further customisation is available via the 7 Custom Menu options, which let you create, save and recall up to 7 sets of user-defined settings. Finally there's an external flash hotshoe for suitable dedicated external units - note that the X-Pro2 has no built-in flash. The X-Pro2 has a more logical rear control layout than its predecessor. Instead of a vertical row of three buttons on the left of the LCD screen, as on the X-Pro1, all of the controls are now found to the right of the screen. Alongside the hybrid viewfinder is the View Mode button which manually switches between the LCD and the OVF/EVF, the Photometry button which accesses Multi, Centre Weighted, Spot and Average metering options, the customisable AE-L button, the rear command dial, and then the customisbale AF-L button. Below this is the fantastic new Focus Lever joystick, used mainly for setting the AF point. This is a real boon to anyone who changes the AF point a lot, making it simple to change even when holding the camera at eye-level, and it's something that we hope to see featured on all future X-series cameras. The Quick menu button provides quick access to 16 frequently used shooting settings including the ISO speed, White Balance, File Size and File Quality. amd you can customise which settings are included and the order in which they appear. A maximum of 16 frequently used items can also be registered to the new My Menu option in the main menu. By default, the 4-way controller is now used to change the drive mode, film simulation, white balance and AF mode. In the middle of the controller is the Menu/OK button, which accesses the much improved GUI. The self-explanatory Playback, Delete and Disp/Back buttons complete the revised rear control layout.